Five researchers have been named winners of the 2018 OWSD-Elsevier Foundation Awards for Early-Career Women Scientists in the Developing World for their research in the physical sciences. The winning scholars from Bangladesh, Cameroon, Ecuador, Guyana, and Indonesia are being recognized for their accomplishments in applied mathematics, physics, theoretical and computational chemistry, environmental and material chemistry, and organometallic and coordination chemistry. As well as leading and mentoring young scientists in their respective disciplines, the scientists are also recognized for their commitment to improving lives and livelihoods in their communities and regions. “These scientists are living proof that, if given the opportunities and support, women all over the developing world can become leaders in their field. I salute them all and commend them for their commitment to their fields of study and to the improvement of the lives of men, women and children in their communities. 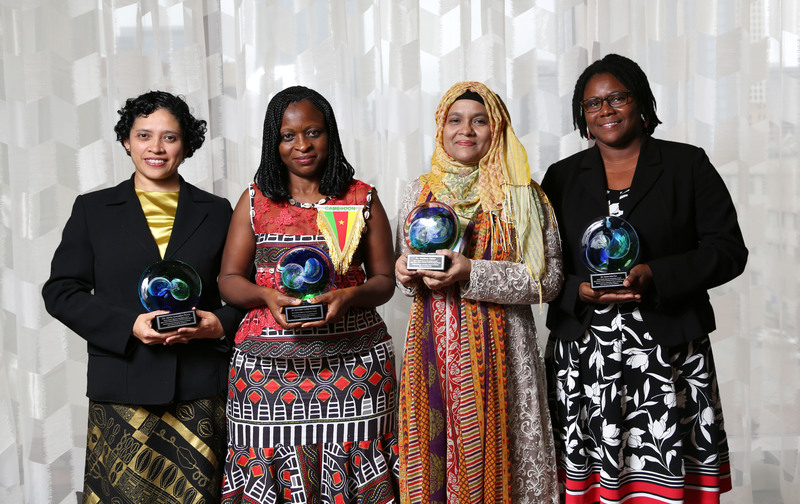 They serve as role models for all young girls and women aspiring to achieve success in their fields,” said Jennifer Thomson, President of the Organization for Women in Science for the Developing World (OWSD). Witri Wahyu Lestari of the Universitas Sebelas Maret, Surakarta in Indonesia (East and South-East Asia and the Pacific Region); in organometallic and co-ordination chemistry. The awards are part of a 7-year partnership between OWSD and the Elsevier Foundation. OWSD chairs a panel of distinguished scientists to select the winners, and the Elsevier Foundation supports a cash prize for each winner of USD $5,000 and an all-expenses-paid trip to attend the 2018 American Association for the Advancement of Science (AAAS) Annual Meeting, this year in Austin, Texas, February 15-19, 2018. The five winners will be honored on 17 February at a special breakfast ceremony during the AAAS meeting. Read more about the winners and get live updates from the awards on Saturday, February 17 on Elsevier Connect. The awards ceremony will take place on February 17, 2018 during the Minority and Women Scientists and Engineers Networking Breakfast from 7:00-9:00am in Austin, TX at the American Association for the Advancement of Science (AAAS) Annual Meeting. Reporters wishing to attend the ceremony can contact Domiziana Francescon at +31 610215901 or d.francescon@elsevier.com. Reference sheets for each award winner with a more extensive biography and description of their work are also available upon request.